His real name was Walter. He was a big boy, 6’2, 205 pounds, which undoubtedly led to his nickname. Moose had a few good power years, knocking in 88 runs in 1957 and hitting 26 home runs in 1958. In ’58 he had three homers in one game (5/30/58) against the Dodgers. Moryn was never exactly an acrobat in the field, but his outstanding shoestring catch with two outs in the ninth saved Don Cardwell’s no-hitter against the Cardinals in 1960. That was probably the highlight of his Cubs career. While Moose was a fan favorite, his teammate Jim Brosnan claimed Moose was never very happy with the Cubs. In the book Wrigleyville, Brosnan is quoted saying Moryn was constantly complaining that he was traded away from the Dodgers, because he always wanted to play on a pennant winner. Needless to say, he never did with the Cubs. His real name was Berlyn Dale Horne and he was a right-handed reliever for the 1929 pennant winning Cubs. The nickname came from real-life trader and adventurer Alfred Aloysius “Trader” Horn, who was famous at the time for his safaris in Africa. Trader Horne the pitcher was a 30-year-old rookie finally living his dream on that great 1929 Cubs team. Cubs owner William Wrigley had a soft spot for this 10-year minor league veteran. Unfortunately for Horn, he simply couldn’t find home plate. He gave up 21 walks and 24 hits in 23 innings. By the time the Cubs made it to the World Series against the A’s that year, Trader had pitched in his final major league game. Charlie was the starting second baseman in the 1918 World Series for the Cubs. During the regular season he had split time at 2B with Rollie Zeider, but he played every game against the Boston Red Sox during the World Series. He batted sixth, and hit .389 for the series, including an impressive 2 for 2 against Babe Ruth in Game 4. 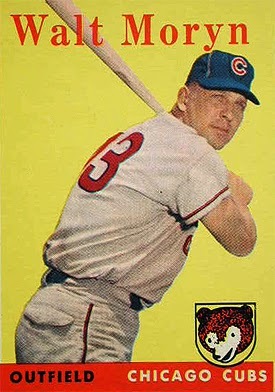 The Cubs traded him the following season (along with Les Mann) to the Boston Braves for Buck Herzog. Fryman was already in his 12th season in the big leagues (and had been a two-time All-Star) when he arrived in Chicago. The Cubs acquired him for starting pitcher Bill Bonham. Woody got off to a slow start with the Cubs, and by June they figured he was washed up at age 38. They traded him to the Montreal Expos, and wouldn’t you know it, Fryman pitched another six seasons. In his career, Woody played 18 seasons, won 141 games, and fielded his position about as well as it could be fielded. He had three seasons with no errors at all, and his lifetime fielding percentage of .988 is the sixth best in history. After his playing career, Woody retired to his native Kentucky and passed away in 2011. The idea was to platoon Ruggiano, because he hit lefthanders much better than righties, but the Cubs didn’t face many lefties. He only appeared in 81 games and hit six homers. The Cubs traded him to the Mariners after the season. Current Cub Relief Pitcher Brad Brach was born today. Brad Brach (/brɑːk/ brahk; born April 12, 1986) is an American professional baseball pitcher for the Chicago Cubs of Major League Baseball (MLB). He has previously played for the San Diego Padres, Baltimore Orioles and Atlanta Braves. Brach was an All-Star in 2016. Brach grew up in Freehold Township, New Jersey, where he attended Freehold Township High School. He enrolled at Monmouth University and played college baseball as a starting pitcher for the Monmouth Hawks through his senior year. He holds the school record for career wins and strikeouts. The San Diego Padres selected Brach in the 42nd round of the 2008 Major League Baseball draft; he was signed by the Padres’ Northeast Scouting Director, Jim Bretz. Brach spent 2009 with the Class-A Fort Wayne TinCaps and 2010 with the Class-A Advanced Lake Elsinore Storm pitching in relief. He was named the California League’s Pitcher of the Year for 2010 after posting a 2.47 ERA and saving a league record 41 games in 62 appearances. Brach began 2011 with the Double-A San Antonio Missions and was promoted to the Triple-A Tucson Padres in July. Between the two clubs he posted a 2.89 ERA and 94 strike-outs in 71​2⁄3 innings. Brach was called up to the Major Leagues for the first time on August 31, 2011, working 1​1⁄3 innings against the Los Angeles Dodgers. He stayed with the Padres through September, appearing in eight more games and finishing with a 5.14 ERA and 11 strike-outs. Brach made the Padres’ 2012 Opening Day roster, replacing an injured Tim Stauffer. He was optioned to Triple-A Tucson on April 16 after five relief appearances, but was recalled on May 4. He was optioned to Tucson again on June 28 to make room on the roster when Andrew Cashner returned as a starter, but was recalled on July 4 when Cashner was placed on the disabled list. Brach remained with the Padres through the rest of 2012, posting a 3.78 ERA in 67 total appearances and striking out 75 against 33 walks in 66​2⁄3 innings. Brach was designated for assignment by the Padres on November 20, 2013. Brach was traded to the Baltimore Orioles on November 25, 2013 in exchange for minor league RHP Devin Jones. Brach had a solid year in his first season with the Orioles, as he appeared in 46 regular season games with a 3.18 ERA. He struck out 54 batters, having a 7.8 K/9 ratio. Brach recorded his first ever win in the MLB Playoffs on October 3, 2014 against the Detroit Tigers. In 2015, Brach appeared in 62 games out of the bullpen, throwing 79​1⁄3 innings, pitching to a 2.72 ERA and a 5-3 record. He held opponents to a .203 average and had 10.1 K/9. In 2016, Brach was named to his first career All-Star game, along with fellow Orioles pitcher, Zach Britton. (Manny Machado, Matt Wieters, and Mark Trumbo were also selected from the Orioles). Through the first half of the 2016 campaign, Brach posted a 6-1 record, 0.91 ERA and a 0.83 WHIP to accompany 58 strikeouts and 15 walks in 49​1⁄3 innings. He led all Major League relievers in WAR at the break. Despite struggling in the second half, Brach finished the season making 71 appearances, throwing 79 innings, striking out a career-high 92 batters while picking up a career-high ten wins, 24 Holds, two saves and pitched to a 2.05 ERA. He tossed 1​1⁄3 innings and struck out two batters in the Orioles Wild Card game loss. Brach opened the 2017 as the Orioles eighth inning, setup man. He assumed the role of closer early on in the season after teammate Zach Britton was placed on the DL. On April 19, 20 & 21, Brach earned saves in consecutive games. He became the fourth pitcher in Orioles history to record perfect saves in three consecutive days. On July 29, 2018, Brach was traded to the Atlanta Braves in exchange for international signing bonus slot money. On February 11, 2019, Brach signed a one-year, $3 million deal with the Chicago Cubs. The deal includes a mutual option for 2020. Brach throws mostly two pitches: a four-seam fastball at 90-94 mph and a slider at 80-85. Occasionally, he adds a splitter to lefties. Brach lives in Nashville, Tennessee, with his wife, singer-songwriter Jenae Cherry, who was born in Wonder Lake, Illinois. Brach’s younger brother, Brett also pitched for Monmouth and was drafted by the Cleveland Indians in the 2009 Major League Baseball draft. He played minor league baseball until 2014.